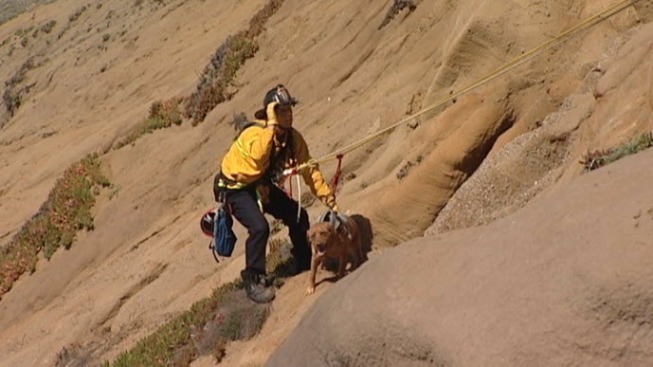 Firefighters rescue a dog stranded on a 200-foot beach cliff in San Francisco. A happy ending for a woman and her dog who were stranded on a beach cliff in San Francisco Saturday. Authorities said the woman and her dog were stranded about 200 feet down a cliff at Fort Funston. The woman was able to make it down to the beach, but she could not get her dog to follow. Rescuers were called in to help but had a little trouble getting to the dog at first. "It was a little windy out here, but we were able to manage to set up an anchor system so we could rescue the person and her dog," San Francisco Fire Department spokesman Kevin Smith said. Smith also said he wanted to remind people with dogs to keep them nearby, especially near the cliffs.